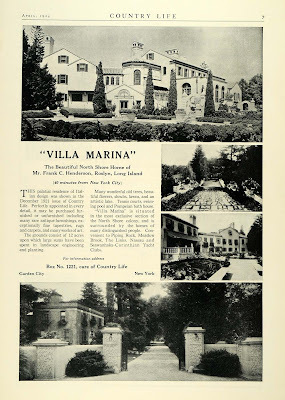 An advertisement for 'Villa Marina', the Frank C. Henderson estate designed by Warren & Clark c. 1920 in Roslyn. Click HERE for more on 'Villa Marina'. Click HERE to see the house on google earth and HERE on bing. Advertisement from Country Life, 1924. I know I am going to be the lone voice here but I like the Italain hill town look minus the Italain hill it should be sitting on. Unfortunately the present home is marred by the huge addition on the front facade for the school, but it really has lost all context without its surrounding gardens and landscaping with appeared to be quite extensive. I agree that from the outside it's difficult to look at this villa-style place today & appreciate how impressive it once was. Zach, are there "then & now" interior photos that you'll post one day? er, Archibuff, with the usual due respect, don't you think my comment agrees with yours, indirectly though I have expressed it? You're not alone. It's almost mystifying to see what people think are good ideas for expansion---almost anything done there could have been done well instead of stupidly. As to the house itself---imho it is neither the best nor the worst of its type...certainly deserving of better treatment. What we're seeing here is death by a thousand cuts. Nope...believe it or not I didn't have the foresight as a seven year old to bring a camera to camp and take pictures of the interior of the house. I did try contacting Pierce last year and no one ever got back to me. I will try again this year. For what it's worth, I haven't been inside the house in close to 20 years so I can only imagine it has changed substantially. It's oddly gratifying to see that such things still go on in this nanny-infested world of ours. er, DED.... I was hypothetically picturing the comments to come, since I was presuming that most people tend not to like this italian/spanish villa style of architecture, especially in the north-east where it can seem a bit out of place. Even the Vanderbilt homne in Centerport gets some flack for looking like a scattered collection of buildings in an uncommon style for teh area. I don't mind the original architecture -- I even prefer it to the Vanderbilt house, at least on the outside. It might look better in Florida, or Southern California, but who really cares? The Pompeiian Bath House (which looked more like a tea house, actually) seems to have given way to a large red water slide, sitting slightly off-center at the pool for nine-year olds. Way up here in the northeasternest part of the northeast, at least a dozen full bore Mediterranean villas were built in the early 20th century. The best were very good indeed, and somehow worked, the others were just sort of surprising amongst the pine trees, with varying degrees of success. I suppose just as well that the Pompeian bath house went....one just doesn't picture the Frank Henderson as Pompeian revel types. Indeed...more than a couple of times (I went to camp there for more years than I care to remember). The end of the year "Pow-Wow" led by proprietor Doug Pierce was something either to be looked forward to or dreaded all summer (I dreaded it). We had rehearsals, Doug Pierce wore a big feather headdress and deerskin clothing and we danced something that was considered to be in the Native American vein among other routines. I imagine it would be rather un-PC nowadays. There was more involved (swimming exhibitions and the like) but the Pow-Wow was the culmination.